Wow what an incredible experience! So my race start was in Blackheath and at that point it was already amazing to see the amount of people starting to line up. 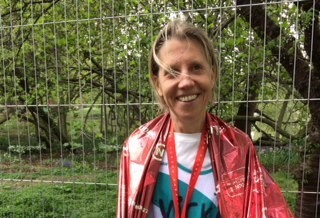 As the race got underway, we merged with the other starts at mile 3 and at this point, I found myself smiling as I saw a huge surge of people join the route as I was telling myself “you’re running the London Marathon”. By now, the noise of the crowds was already overwhelming, and whereas in previous races you start to spread out at this point, you realise that that just does not happen in this race. I remember thinking not only can you hear the crowds but the constant pounding of running feet all around you. The first iconic point at around 7 miles is The Cutty Sark, the sun was shining the crowds were out in their thousands and there was music and cheering all around. You could almost forget you were in a race! Then we were at the half way mark and Tower Bridge, the crowd and noise continued to be phenomenal and reached fever point as we ran over the bridge. I remember just staring up almost having to pinch myself that I was actually running across it –incredible. Next, we were heading to the Quays and Canary Wharf an enjoyable part of the route but tough miles for me between 17 and 21. Mile 19 crept up, more screaming and shouting and I felt privileged to be running around London. The end was almost in sight; I was still on track and even started to believe I could beat my current PB of 3.55 so I pushed on. 24 miles and the crowds cheering seemed to intensify. The final 2 miles were a bit of a blur but there’s no way I could not remember that final 800 metres to the finish, cheering, shouting, encouragement and then it was there the finish line and a time of 3:50:24 – a PB in London. A day I will not forget in a long time!